A post from Camille Hunting. A person you will want to strive to be more like! I have been pondering a lot lately about trials and the things they can teach us. It is becoming clearer to me the older I get that trials are indeed blessings when we invite the Savior to help us experience them and learn from them. Adversity is what oft times brings me to my knees and causes me to truly hunger and thirst after the Spirit in my life. Most times I cannot see the blessings, the things I learn, and the way my character is molded until the storm is calm and the dust has settled. Then my eyes are opened, my perspective expanded, and my heart filled with gratitude for a loving Heavenly Father who blessed me with an opportunity to grow and become that much closer to Him and to being the woman I long to be. My favorite scripture is Isaiah 41:10 & 13, which says, "Fear thou not; for I am with thee: be not dismayed; for I am thy God: I will strengthen thee; yea, I will help thee; yea, I will uphold thee with the right hand of my righteousness . 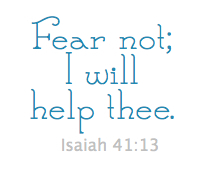 . . For I the Lord thy God will hold thy right hand, saying unto thee, Fear not; I will help thee." I read this at the end of a long day of heartbreak and sorrow--the day my brother committed suicide almost five years ago. I did not want to read my scriptures that night. I was emotionally, physically, mentally, and spiritually spent. My world was shattered, and I had no idea how the pieces would ever fit back together. But I knew in my heart of hearts that my answers and strength and power would be found within the pages of the scriptures. So I picked them up, opened, and read. Bam! I felt a closeness to my Heavenly Father and Savior that saved my broken heart that night. I did not have to be afraid because I was not alone. The path ahead was foreign and dark and nothing I had ever wanted to experience, but it was not impossible. And the trials continued--with those same two verses of scripture bringing sweet peace and reassurance. My sweet mother went to the psychiatric hospital the next month for two weeks. My father almost died due to bleeding ulcers two months later. My brother was life flighted with serious health problems three months later. A few years later he also chose an alternative lifestyle that broke our hearts. I had heart surgery. Another brother chose to drown his sorrows in alcohol. I was diagnosed with celiac disease after long health struggles. My sister decided she never really had a testimony to begin with and wasn't about to get one now. I had a cancer scare and subsequent surgery to remove the mass. I don't share those things to make me look amazing or to beg for pity. I only share them knowing that these trials have all been part of my journey to where I am today. They have been part of my "beautiful heartbreak," as Hilary Weeks would say. As I have faced my trials allowing faith to overcome fear, I have been blessed in so many ways. I am able to have immense compassion and empathy for others when they face tragedy. I readily serve those around me and truly do love them for who they are: children of God. I do not judge them because I have learned that I have no idea what trials are in their lives. I would never have developed these traits to this depth and extent without the trials and adversity I have experienced. I know that I am just an average woman experiencing an average life and learning to press forward through my average trials. How beautiful it is to know that we can learn and grow through our hardest times of adversity. And we can do it without fear because the Lord will strengthen us and uphold us and make more of us than we ever could on our own. That, to me, is worth it. Oh, my dear sweet Cami! I love you! Thank you for your example!! It is so awesome that you came through your trials with faith and were able to use them as a means of developing a stronger testimony and conviction of the gospel. And I love that scripture you shared from Isaiah. When I was going through a hard time on my mission I had a great companion who shared it with me. It helped me out a lot then, and has helped me get through a lot since then. Elder Scott once spoke of the great strength and power that verses of scripture can be to us throughout the challenges of life, something which I have found to be so true time and time again.